MacBook Pro Right-Click Drag, Fxx Keys, etc. The MBP comes with a beautiful backlit keyboard and a multitouch trackpad that is also a big button. Both are very pleasant and easy to use–unless you run Windows or run into an application that require that you press the Home key. Then you’re hunting newsgroups for the magical key combos. The tough thing is to figure out how to right-click drag. You can usually find some other way of accomplishing a right-click drag task, but sometimes you just can’t. If I want to share one folder to another in SourceSafe, there’s just no other practicable way. 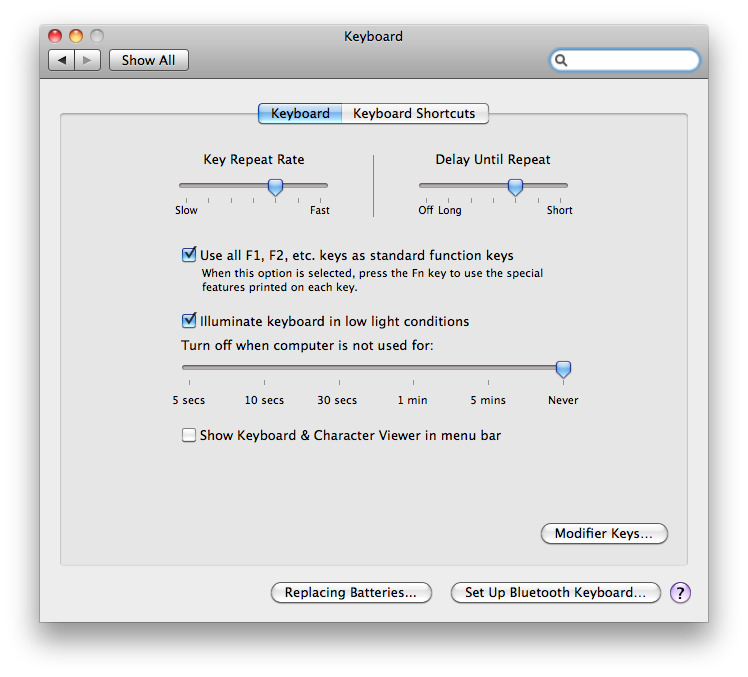 When I need to, I activate System Preferences->Trackpad->Secondary Click and choose ‘Bottom-Right Corner’. Then you can simply click the big button in that corner with your right index finger and use your left index finger to move the item around. When you’re ready to drop, let go with your right finger. I always turn this setting off when I’m done because I end up right-clicking when I don’t want to. The function keys are relatively useless on a MacBook Pro since most of the commands can be accomplished more easily by trackpad gestures. You usually use the alternative functions of the keys like volume and brightness controls. The opposite it true on a PC, especially for thing like search where you keep hitting F3 or debugging in Visual Studio where you’re hitting F9 through F11 over and over. It gets to be a real pain to keep hitting that Fn key. Fortunately, there’s an easy way to reverse the functionality of the Fn key so that the function keys are fired without pressing anything else and the volume, brightness, etc. controls are the ones enabled by pressing Fn. Just go to System Preferences->Keyboard and check the box called Use all F1, F2, etc. keys as standard function keys. Here’s an example of the setting turned on. When you’re done, then go ahead and uncheck the box. Ideally, you could create a script to quickly set and unset the setting for daily usage, but it’s really not too much to remember it. Sometimes, when running Windows, you’ll need to use the Insert key. 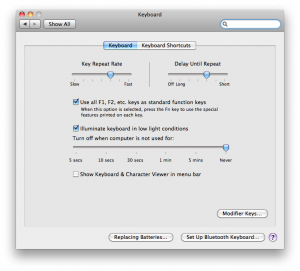 None of the keyboard mappings I’ve seen have indicated what to use except the Insert key on a full keyboard (duh!). This entry was posted in Uncategorized and tagged mac, MacBook Pro, tips.